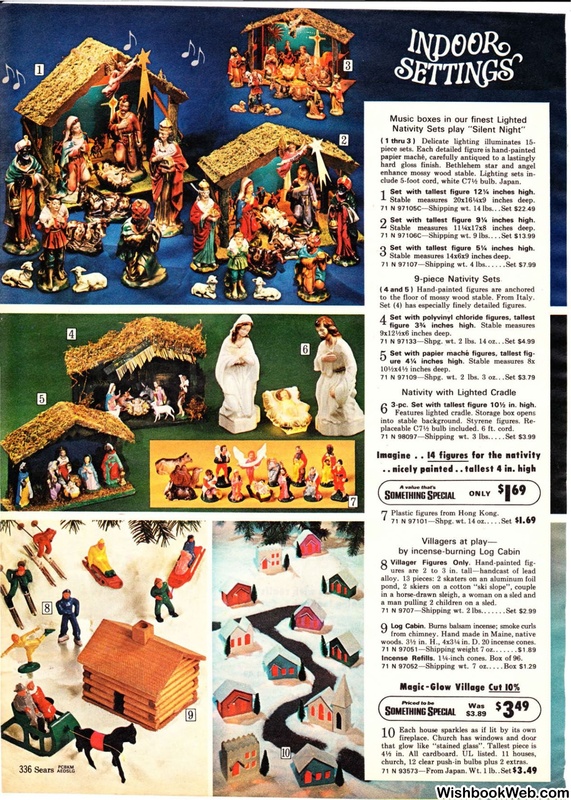 Nativity Sets play "Silent Night"
clude 5-foot cord, white C71h bulb. Japan. Stable measures 20x161Ax9 inches deep. Stable measures 11'Axl7x8 inches deep. Stable measures 14x6x9 inches deep. to the floor of mossy wood stable. From Italy. Set (4) has·especially finely detailed figures. placeable C71h bulb included. 6 ft. cord. Plastic figures from Hong Kong. a man pulling 2 children on a sled. in. D . 20 incense cones. Incense Refills. 1 'A-inch cones. Box of 96.
church, 12 clear push-in bulbs plus 2 extras.